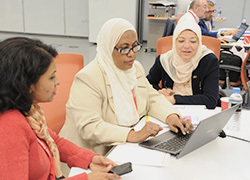 In November 2014, Weill Cornell Medicine - Qatar announced a restructuring that resulted in the integration of its academic programs into one cohesive Six-Year Medical Program. A single admission process now determines entrance to the Six-Year Medical Program and students will progress through the course according to advancement criteria, which include academic performance, professionalism and commitment to the profession of medicine. This replaces the previous system under which students who successfully completed the two-year pre-medical curriculum were required to go through a second admissions procedure to enter the four-year medical curriculum. The new, integrated Six-Year Medical Program removes the need for a second application, streamlining the process and allowing students to maintain focus on their studies. Students who successfully complete the Six-Year Medical Program are awarded the Cornell University Doctor of Medicine degree. Under the new system, students who complete pre-medical training at another institution are still welcome to apply to the WCM-Q Four-Year Medical Curriculum. If you are a student in high school, please click on Six-Year Medical Program. If you are a college/university student who will be completing their undergraduate degree in the current academic year or have completed your undergraduate degree, please click on Four-Year Medical Curriculum. Please contact the WCM-Q Admissions Office at: admissions@qatar-med.cornell.edu for any additional information and questions.